Brute Force One of hacking way used application programs to decode encrypted data such as passwords or Data Encryption Just as a criminal might break into, or “crack” a safe by trying many possible combinations, a brute force cracking application proceeds through all possible combinations of legal characters in sequence. Brute force is considered to be an infallible, although time-consuming, approach. To help prevent dictionary brute-force attacks many systems will only allow a user to make a mistake in entering their username or password three or four times. If the user exceeds these attempts, the system will either lock them out of the system or prevent any future attempts for a set amount of time. 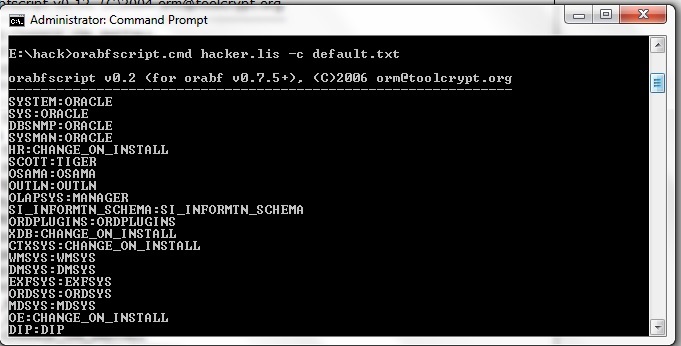 Today i will provide example how to crack oracle password using Tools called orabf please remember it’s only example and there’s million tools can do the same i will mention it later in this Topics and work on them in another thread. Orabf is an extremely fast offline brute force/dictionary attack tool that can be used when the particular username and hash are known for an Oracle account. Obviously the speed of the brute force attack slows down the longer the amount of characters that it is trying to brute force with but for short username/hash combinations it can be over a million tries per second. and you can visit the website here. Remember Default.txt is the file already exist in the software and output append inside this file. Follow the above steps and let me know.